As parents we are responsible for what goes into our children’s bodies. 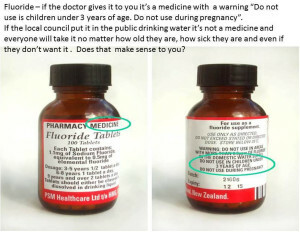 Fluoride Free NZ has serious concerns about children, in particular infants, consuming fluoride. Parents should never use fluoridated water to mix infant formula for babies who need it. See our page about this very important information here. Fluoride is not an essential nutrient. The human body does not need fluoride at any stage of development. When the body is deprived of fluoride, no disease state occurs. Teeth and bones are healthier without fluoride. An over exposure of fluoride can cause fluorosis, which is a permanent condition of the teeth. A study Dietary fluoride intake for fully formula-fed infants in New Zealand; impact of formula and water fluoride published in the Journal of Public Health Dentistry in 2010 found that fully formula-fed infants have a high probability of exceeding the Upper Limit for fluoride and are at increased risk of dental fluorosis. Vitamin C is an example of an essential nutrient. If this nutrient is absent, then disease occurs. In Vitamin C’s case a lack of it causes scurvy. Far from being an essential nutrient, Fluoride has now been classified as a neurotoxin by Harvard scientists. Fluoride’s toxicity is on the same level as arsenic and lead, which are also naturally occurring elements. Just because something is naturally occurring does not mean it is safe. 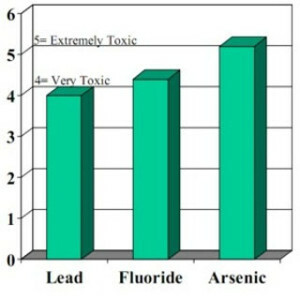 Synthetic fluorides, like Hydrofluorosilicic Acid which are added to the shared public water supply contain many carcinogenic contaminants as well. There is some controversy about children under the age of 8 using fluoride toothpaste. Despite the best efforts of parents and caregivers many children swallow toothpaste and this can be very dangerous. Many countries require warning labels on fluoridated toothpaste which state that if swallowed immediately call poison control. See our tv ad showing our concern for children here. 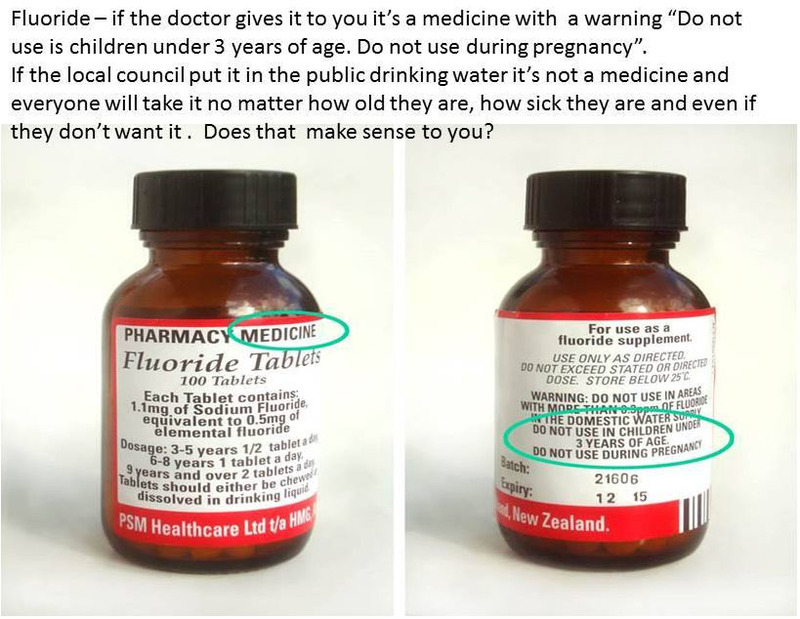 Fluoride tablets are no longer recommended by the NZ Ministry of Health. Click here. In summary, we recommend that your children, in particular infants, avoid consuming fluoride. Swallowing fluoride has effects on your children’s whole body not just teeth. The latest peer reviewed scientific study to do a full analysis on when fluoride exposure is most likely to cause dental fluorosis was conducted by Hong et el and published in the Community of Dentistry and Oral Epidemiology last year. They concluded that the front teeth were most at risk from developing fluorosis from fluoride intake during the first 24 months. They also established that fluoride intake needed to be less than 0.05 mg/kg per day for fluorosis not to occur. This quite clearly shows that bottle-fed babies in Lower Hutt will be getting at least twice the amount that causes dental fluorosis and well over 100 times as much as their breast-fed counterpart. The National Research council “Fluoride in Drinking Water 2006” chapter 8, Effects on the Endocrine System, found that in humans, effects on thyroid function were associated with fluoride exposures of 0.05-0.13 mg/kg/day when iodine intake was adequate and 0.01-0.03 mg/kg/day when iodine intake was inadequate. Bottle fed babies are getting a dose that is associated with an effect on the thyroid, even when iodine intake is adequate. Add to this, the fact that there are now a number of studies linking high fluoride intake to lowered IQ and that it has been known for quite some time that breast-fed babies generally have higher IQs, fluoridation has to be one of the most cavalier and reckless public policies ever. According to Plunket statistics, 56% of women exclusively breastfeed in the first five weeks. This drops off to 16% by the seventh month. 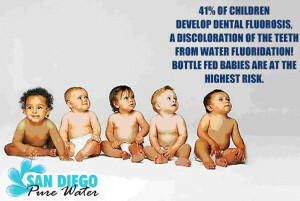 Breastfed babies have a fluoride intake per unit of body weight which is much lower than the average for all people. 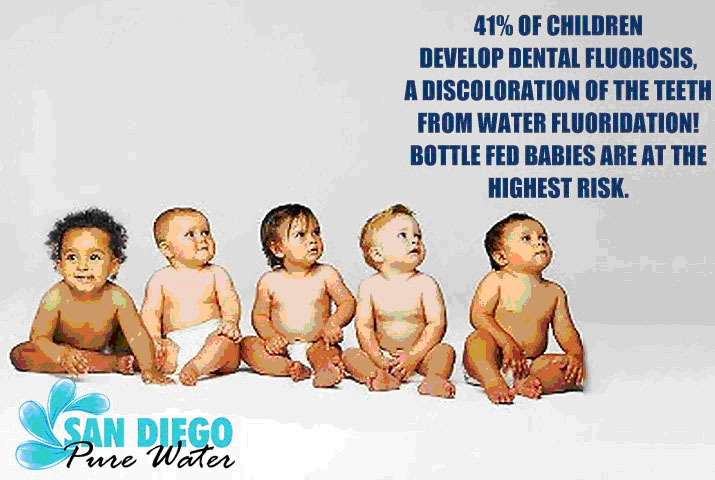 Babies fed formula made up with fluoridated water have a fluoride intake per unit of body weight which is much higher than the average for all people. 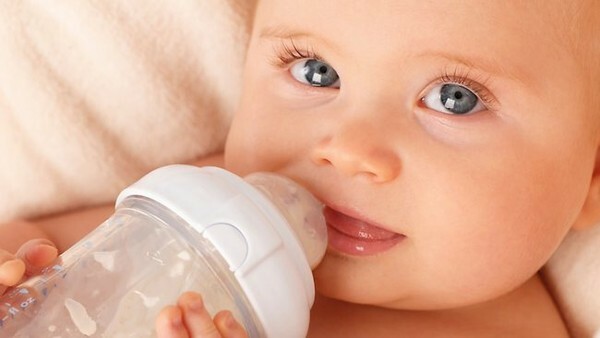 Infants are also more vulnerable to toxins than older children and adults. It can’t be proved that excess fluoride exposure is responsible for the lower intelligence of formula-fed babies, because the criminally negligent authorities in fluoridating countries refuse to fund the necessary research, but it’s highly plausible. No evidence of transfer of fluoride from plasma to breast milk Ekstrand J, et al. (1981). British Medical Journal 283: 761-2. “These findings show that plasma fluoride is poorly transferred to breast milk and infants thus receive almost no fluoride during breast feeding. This is in contrast to another halogen, bromide, which reportedly accumulates in breast milk.” “The existence of a physiological plasma-milk barrier against fluoride suggests that the newborn is actively protected from this halogen. Hence the recommendation made in several countries to give breast-fed infants fluoride supplementation should be reconsidered.” The following information is from the 2006 US National Research Council report on fluoride in drinking water. 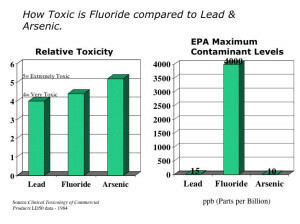 p 52 Table 2-12 Total estimated (average) chronic inorganic fluoride exposure (mg/kg/day) from all sources for non-nursing infants below the age of one year is 0.100 for a modeled water intake, and 0.115 for the EPA default water intake, with a fluoride concentration in drinking water of 1 mg/L (i.e. 1 ppm). p 53 Table 2-13 The figures given for high water intake individuals drinking water at 1 mg/L are 0.084 for athletes and workers, 0.134 for diabetes mellitus patients aged 3-5 years, 0.084 for adult diabetes mellitus patients, 0.184 for nephrogenic diabetes insipidus patients aged 3-5 years, and 0.164 for adult nephrogenic diabetes insipidus patients – units are mg/kg/day. p 69 Table 2-18 lists a value of 0.10 mg/kg/day as a “Tolerable upper intake” for ages 0-8. Fluoride Free NZ is an organisation that was established in 2003 to end water fluoridation in New Zealand. Our goal is to educate Kiwis about how water fluoridation doesn’t work, is not safe and robs you of choice. We will discuss the real solutions to poor dental health, provide immediate solutions for you to avoid fluoridated water and offer steps to end fluoridation in your area. Fluoridation creates a false sense of security in the fight against tooth decay. While precious resources are wasted on adding a fluoride chemical to the water supply our communities are taking their eye off real solutions. To learn more about who is behind Fluoride Free NZ click here.